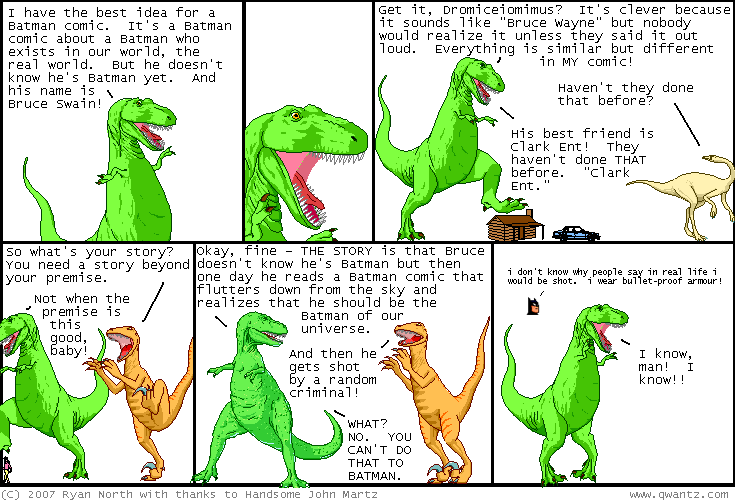 Dinosaur Comics - September 10th, 2007 - awesome fun times! September 10th, 2007: This weekend I attended the fifth annual Board Meeting, which is basically a critical mass ride for longboarders, only we dress up in dress shirts and ties because of the hilarious pun! It was so much fun. There were over two hundred and fifty of us! One guy looked like Albert Einstein and he was my favourite. I don't see any pictures online yet though so you won't get to see him OR the creepy moustache I was sporting for the event, a moustache called the "Herbert Kornfeld". I forgot to mention: the I've Got My Own Problems shirt failed to meet the stratospheric expectations I had for it, so if you want one, be sure to order it before the end of tomorrow, Tuesday, because at that point they are DISAPPEARING. One year ago today: t-rex calls it a fiver because that's what he imagines counterfeiters call them when they brag to each other about counterfeiting?